Given the extreme danger of downhill racing, one would expect an aggressive attitude from one of the sport's top athletes. Certainly bravado. At the very least, heavy metal music thumping in his helmet. Not Steven Nyman. Try understated. Calm. No ear buds. A three-time Olympian and U.S. Ski Team veteran whose mission is to win a World Cup Globe, Nyman represents the modern downhiller jettisoning the macho clichés of the past. Despite the hard charging speed-driven exterior, 'grounded' best describes Nyman's most compelling personal characteristic. Contrary behavior would be excused considering his stream of consciousness runs between the Yin and Yang of pushing the limits and self-preservation. No need. A deliberateness of focus and purposeful determination guides his persona. But make no mistake; his cool outer shell contains within it a passion churning like no other in alpine ski racing. That drive has earned Nyman 10 career podiums—three of them victories—and, more importantly to him, his place among the elite brotherhood of downhillers. POWDER sat down with Nyman at Adolph's, his favorite Park City restaurant, the evening before he boarded a flight to Norway for some late season training and equipment testing. He was very candid about his long journey in ski racing and his quest for an FIS Globe in downhill, a trophy that continues to elude American men. POWDER: First, congratulations on a great season and four consecutive podiums—a U.S. Ski Team men's record. Steven Nyman: Thanks! This gives me a lot of momentum going into 2017. 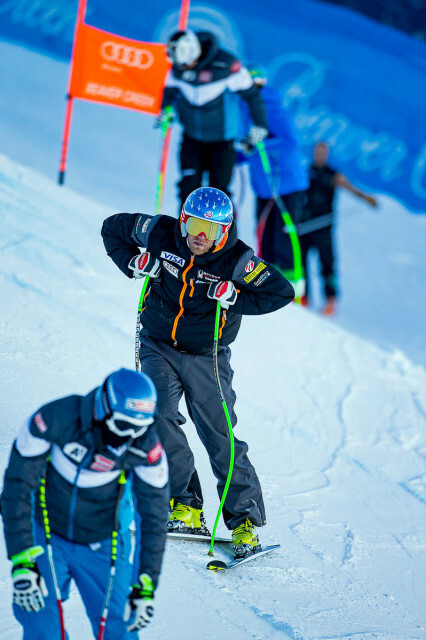 How long have you been involved in ski racing? The road has been long and winding. This is my 20th year of racing. I started with the Sundance Ski Team at 14, then the Park City Ski Team and the USSA/FIS programs. This is my 15th season with the U.S. Ski Team. Since the 2014 season—where you finished outside the top-30 in downhill—you've had six podiums. What changes did you make to create this turnaround? I reestablished my focus by simplifying my approach; only working on three things at a time. I used to keep a detailed journal but realized that, though there may be similarities, in total all things will be different. Now I keep it simple and look at things with a 'beginner's mind,' a blank canvas. It's a new way for me to approach racing—holistic with a heavy dose of reality. What level of commitment, sacrifice, and belief in yourself does it take to have the World Cup success you've had? The workloads and expectations are very high at the World Cup level. We're on snow as much as 10 months a year. Training starts with a three-month block of dryland—May to July, followed by on-snow training in Chile, New Zealand, and Colorado from August through November. The schedule is intense, four to five days on and one to two days off. But this is when improvement and good habits happen. The goal is get to the point where everything is automatic when you break the start wand. The perception can be that downhillers are adrenaline junkies. What's the truth from your perspective? You can die doing what we do. For the younger guys, adrenaline may be part of it. But the veterans are more introspective, we're problem-solvers. There are a million pieces to the downhill puzzle and a lot of calculations go into how to solve it. During training runs, I'm looking at where to apply my strengths to create a speed advantage and where I need to perform good enough for that advantage to show up on the clock. I'm a strong glider, so I'm not going to risk it all in a turn when there's a 20-second gliding section coming out of it. Do team dynamics play a role in your individual ability to perform? Yes. A strength the U.S. Ski Team has over the Euros is being less structured versus being 'machine-like.' We have more flexibility, better adaptability. Our team members come from diverse backgrounds, have different styles, and are free-spirited—more like cowboys. The strict Euro structure wouldn't have worked for me. Here, you have to be good at maximizing what you're given. We're racing because we love it, not to be part of a system. Does the attention athletes get, particularly from European fans and press, impact performance? Most Euro racers are high-maintenance with layers of internal support, huge fan bases, and constant press coverage. That can weigh on you individually. I don't have an entourage like Bode or Lindsay, but people do recognize me now and congratulate me. That's motivating. The lesson is to keep it all in perspective—priority one is to yourself and the team. What do you enjoy most about ski racing? The people you meet and relationships you make are the best part of the experience. Are there any experiences you've had in training or racing that can translate to the average skier or younger racers? Yes, understand that you're only as strong as your weakest link—technique, equipment, fitness, diet, and energy level—rest versus partying. Recognize and maximize your strengths. At the same time, refocus on improving your weaknesses. If you don't love what you’re doing it will become a task instead of a passion. Accept that you're going to have ups and downs and embrace the challenges. What are your plans going forward for ski racing and beyond? My biggest goal is to get the World Cup downhill title—a (FIS) Globe. No U.S. man has ever done that. This year was a big confidence booster towards that goal and this summer I'll be working on specific areas to accomplish this objective. My plans right now are to focus on three things—the 2017 FIS World Championships in St. Mortiz, the 2018 Olympics in Pyeongchang as well as the 2019 World Championships in Are, Sweden—a venue where I know I can win. After that, we'll just have to see. After racing, I'll likely stay in the ski industry in some capacity—coaching or mentoring other racers. What's important to me is to give back to future generations of downhillers.